First of all, you say it like this, “Mah-ross-key Pea-ch”. And, second of all, yes, their new leotard does have that high of a cut! Designers and besties, Jordon and Elisa, talk about their travels in America and their shoot with myself and Jack Bool in northern California. Tell us about your name Maroske Peech - where does it come from and can you spell it out phonetically so people know how to say it? It’s a combination of both our mother’s maiden names. We will let you decide who is the Maroske and who is the Peech: mah-ross-key pea-ch. In terms of design and clothing construction what are each of your specialities? Jordan: We both design differently, so we often present each other with illustrations, pictures, fabric swatches/samples to discuss and throw ideas around. Elisa: It’s very playful. That’s the fun bit and everything after that is a labor of love. During our formal studies we both focused on developing different specialties, but we are constantly pushing ourselves with each collection. We are currently completely made in house at our studio in Brunswick. We also love photographing our prototypes and developing ideas that way. We love stretch & our favourite category to design is tops. Do you two have pet names for each other? Are you still talking after a two-week trip overseas together? Elisa: Jay, Jordy, Jordy shore, Jordy boy, jordiboiiv, the other Lohan, the situation and Debbie. What does the name of this collection Flexible Reality mean? Explain. Elisa: Flexible Reality is based on a text I sent to Jordan which we can’t find. But I’m quoting something from Vestoj’s issue 8 on Authenticity in Fashion. We are just wearing the costume of the times. Jordan: Have you read “The Secret” by Rhonda Byrne? If this collection tasted like something what would that be? What were some of the things you found exotic, weird, different or "so american" while on your visit? Jordan: the swimming pool was intense, like I just wanted to swim. Jordan: I’m into the idea of ‘experimental dinner parties’ - They’re not a new concept but I think L.A has tapped into the zeitgeist and found a gem. Give us a few details or highlights about each city. Did you run into any stars in Hollywood? Any weed in SF? Any pizza rats in NYC? Jordan: I lost my shoes in Hollywood. Elisa: I accidentally touched a stray wet cat who hung out around a hostel we stayed in and we walked around the Getty before it opened. It was like being in Spirited away. Jordan: We were asked to be on TV in LA, but I couldn’t be bothered to wait 10 minutes. We will always have Venice Beach Muscle Gym. Elisa: We also went to China as a stopover. That counts too because if we weren’t in China I don’t know where we were? You shot this collection in California with Jack Bool, myself and some amazing models. Describe the shoot day and what it was like! 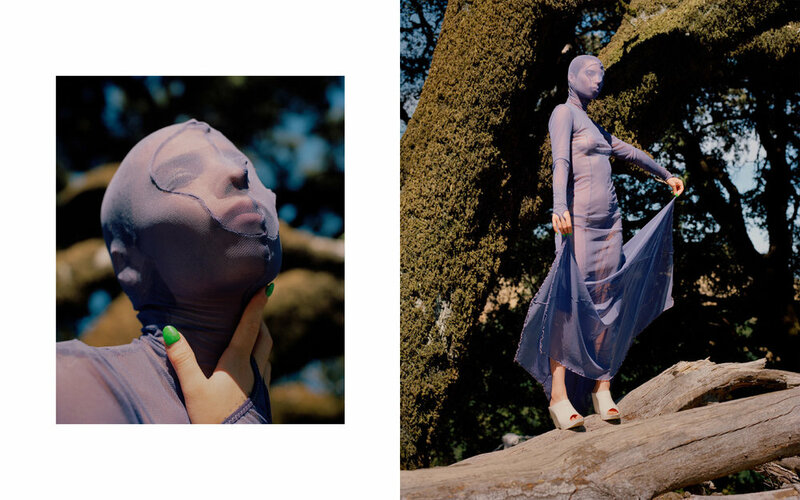 Jordan: This was the first time anyone had shot these clothes other than us, so it’s refreshing to hand over the work to someone else to cast their eye. The team we worked with were all super lovely and it was nice to meet people who we had been working with externally face-to-face! Elisa: I’m never really on shoots, let alone outside on a shoot. Jack got on his assistant’s shoulders, climbed trees and mountains to get the shots he wanted. It was a treat to see the way he works! Also California’s hills and mountains are pristine, rugged and wild! It’s very different landscape to the bush in Australia and I was blown away! Lastly we just want to express how lucky we were to shoot with the amazing models! Jackie, Semaj & Vera, really embody our label and most of them have worn our clothes before! They are so cheeky and fun!